So let me start off by saying I HATE fondant icing and equally hate icing that is just way too sweet that it gives you a tummy ache. 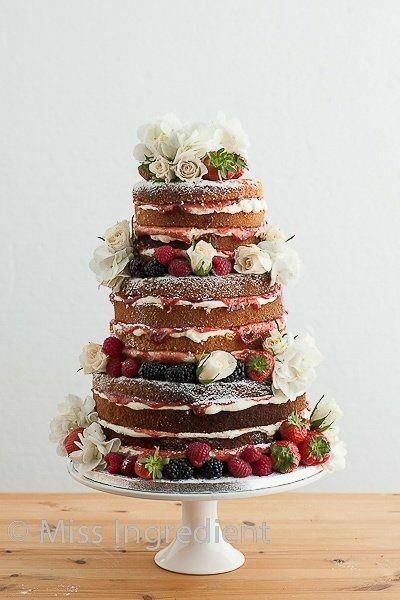 So I thought I have found a happy medium with the naked cake trend. 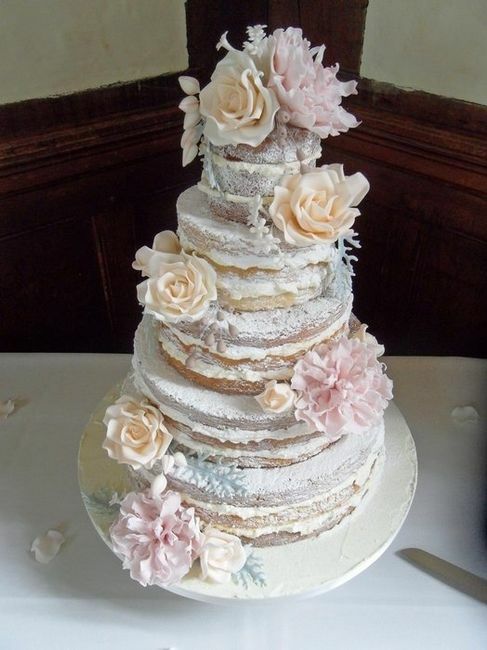 It has icing in between the layers and it has that diy vintage look that I'm going for. Only problem is my mom and sister said they look stupid and none of the other guests will get it. Whats your take on it? I put a couple of pics of what i have imagined..
Lol@Samantha Renee. Yeah I loved the top one, too! I was leaning more towards it anyhow. I just have to remember that I can't always be a people pleaser! I think it will photograph nicely and goes well with the theme. Thanks again, everyone!! I Just don't want to fall victim to wedding trends and then hate it later. It is nice to get an outsiders input! My personal opinion is that unless they are done VERY well, they tend to look ugly and unfinished. I think your 2nd inspiration pic is done well. Most of the ones I've seen on Pinterest just look a mess. I'd see if you can get a baker who'll do Swiss meringue buttercream -- it's much less sweet than the usual kind. I think they look like someone messed up and forgot to frost them. The other thing you could do is whipped cream frosting. We might do that. I was going to go with cupcake tower or whatever. Then we decided on cake, had a tasting and weren't impressed and this is our favorite bakery. The other day fbil brought over a Strawberry Shortcake and OMG it was the best cake I've ever had. So we're going to check that place out and hope they make wedding cakes. I mean it was sooooo good. Thankd again for the advice! Either people are going to love it, or hate it. I guess I will just have to talk to the baker and get their ideas. I the swiss buttercream I heard, from my cousin, is really good! At least I have options! If you want it- do it! I actually really like this idea for a vintage-y wedding! This is the one I was thinking about doing! Beware- though! Less frosting does not = less money. Which seems silly to me...in fact, they told me it would be more expensive because the cake underneath needs to look precise. They can't hide the flaws with frosting. I'm doing a naked cake too. I LOVE this trend and it matches perfectly with my rustic country theme. Below is my inspiration. I think, aside from marrying FH, I am most excited about my cake! HAHA! And that's funny about what your mom and sister said. Everyone I've shown it to (those involved in WP and planning) has loved it because it's so different. I say go for it!! I think it is adorable and would for great with a vintage theme! I think if you like it, go for it. 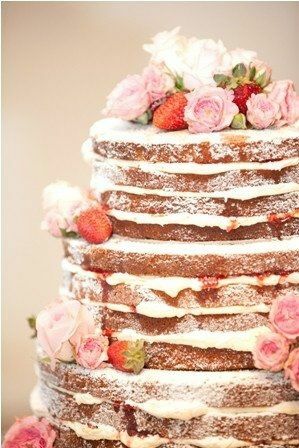 Its your wedding if you want to have naked cake, then do it up!! I haven't looked in to pricing on them, but I would have assumed they're cheaper, not more! That's crazy. 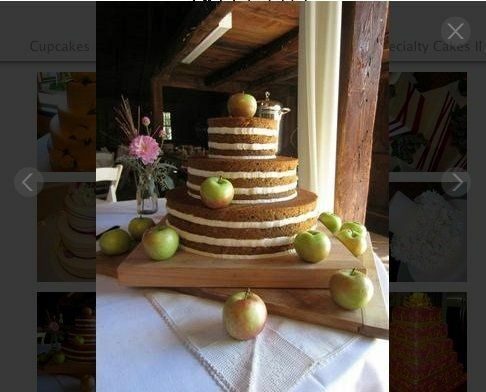 But anyhow, nice to see I'm not the only one diggn the naked cake yrend. Thanks again!